All artists and artworks differ in their ages, educations, techniques and artistic paths but they share the same “double origin”: regional and “proprietorial”. All creations are by sardinian artists and they come from private collections of local collectors. So the exhibition has a double origin. First, the museum: the space is from the second half of 1600s and it is symbolically given back to the city so that it can lives in harmony with citizens again. Second factor is the character of exhibition, the conversion of private into public, the generous share of a pleasure that turns from single into collective. The aim is to connect two separate worlds, usually perceived as elitist and distant: the artistic context and the collectors’ micro-world and also to offer a moment of meeting, delight and thought to the city of Sassari. 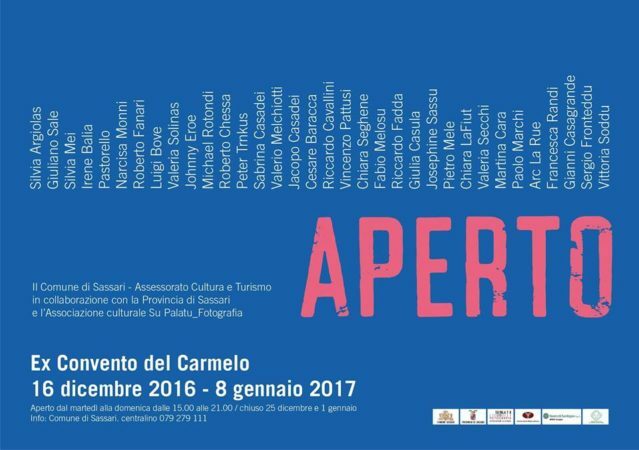 APERTO is like an invocation, a password, a wish, so that every space is open to people, every path that leads to culture is open, every dialogue that feeds the change is open. Silvia Argiolas, Giuliano Sale, Silvia Mei, Irene Balia, Pastorello, Narcisa Monni, Roberto Fanari, Luigi Bove, Valeria Solinas,Johnny Eroe, Michael Rotondi, Roberto Chessa, Peter Trnkus, Sabrina Casadei, Valerio Melchiotti, Jacopo Casadei, Cesare Baracca, Riccardo Cavallini, Vincenzo Pattusi, Chiara Seghene, Fabio Melosu, Riccardo Fadda, Giulia Casula, Josephine Sassu, Pietro Mele, Chiara LaFiut, Valeria Secchi, Martina Cara, Paolo Marchi, Arc La Rue, Francesca Randi, Gianni Casagrande, Simone Carta, Vittoria Soddu, Sergio Fronteddu. Many thanks to Pastorello, Narcisa Monni e Vincenzo Pattusi for curating the exhibition set up.